Learn more about APOPO HERORATS by clicking here! Will Watson learn to detect TNT or TB? Watson is now ready to specialize and needs your help to decide! It has been doing very well so far and is now all set to move to some real sniffer training. To streamline the training process and to ensure that Watson builds an ‘expertise’ in one specific scent; it is important to only focus on one going forward. The next stages will introduce the smell of TNT or of tuberculosis (TB) to Watson and its detection behavior, training scenario, and eventually the area of operation will be shaped accordingly to the chosen scent. APOPO’s mine action programs are implemented in Mozambique, Angola, Thailand and Cambodia. While in Southeast Asia, the organization is currently conducting Non Technical Survey (NTS) to determine the actual hazardous areas, in Mozambique and Angola APOPO is deploying trained and accredited Mine Detection Rats (MDRs) to help demine the countries. If you choose to help Watson become a MDR, it will join a successful team that helped to release more than 6 million m² of land to the local communities last year alone. 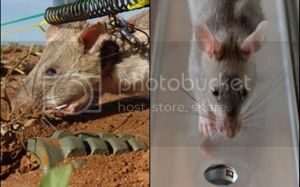 The rats have so far found more than 3,000 landmines, more than 13,000 small arms and ammunition, and almost 2,000 UXOs. Likewise, if Watson joins the TB detection team, it will join a prolific group of rats who have collectively screened more than 180,000 sputum samples and found more than 3,600 additional cases of TB in Tanzania and Mozambique. APOPO partners with TB clinics in these countries which both have very high incidences of the disease, to collect sputum samples from patients with respiratory problems. Early detection is imperative to curbing of TB in a community since an untreated patient can potentially infect 10-15 more people every year. It is a difficult choice but either way, you can be assured that Watson will contribute towards solving some of the world’s most critical humanitarian problems. So, what will it be? Your rat just passed clicker training and is well on its way to becoming a successful HeroRAT! Click goes the food reward. Watson has officially begun its training! It will now learn that a click sound signals that it has earned food! Clickers are widely used in animal training because the click sound bridges the gap between the correct response and the reward. This means that Watson will continue to work knowing that the trainer will signal when it is correct. This method helps the animals rapidly identify the precise behavior that will obtain a reward and adapt as quickly as possible. Clicker training takes place in special glass-walled cages which have single holes for administering food rewards. At first, Watson’s trainer will repeatedly sound the click and immediately deliver food. Later, the trainer will withhold the click to encourage Watson to move progressively further away and return only when the rat hears the click. In scientific terms, the click becomes a “conditioned reinforcer,” meaning that the click itself becomes a reward. The click also becomes a “discriminative stimulus,” meaning that Watson will approach the trainer after hearing the click because it signals that food is available. Click training for Watson will start slow and easy – sessions twice a day for approximately 5 minutes each. Click training is scheduled for roughly two weeks, at the end of which Watson will start its journey as either a mine detection or TB detection HeroRAT. Watson has opened its eyes for the first time! Watson has just opened its eyes! It is still living with its mother, and relies on her for milk and comfort, but is now strong enough to meet its trainer. Watson’s trainer is spending a lot of time interacting with it and exposing it to many different sights, sounds, and smells. This process, called “socialization,” ensures that Watson will not be startled when it is handled by humans or when it encounters something new. Socialization training, which starts as soon as baby rats open their eyes at the age of four weeks or so, will make Watson easier to train and help meet the challenges that it will face later in its career. This week Watson and its trainer took a car ride, played in the grass, listened to music, and met some new people. Though these are fun experiences for humans, for a young rat they can be frightening at first, but Watson is quickly becoming comfortable. After about one week of socialization, Watson will be ready to leave its mother, learn to be relaxed around the various stimuli present in the work environment, trust its trainers, and be more conducive to the remaining stages of the HeroRAT training process. Welcome to the world, Watson! 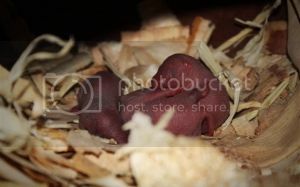 It is celebration time in APOPO’s rat kennels today for the birth of baby Watson and its two siblings. Watson belongs to the species Cricetomys gambianus, commonly known as the African giant pouched rat, which are often born in litters of 2 or 3. APOPO’s breeding program ensures that prospective parents of our future heroes are carefully handpicked to deliver healthy, happy and high-quality rat babies. A successful breeding program increases the likelihood of delivering excellent HeroRATs to detect landmines and tuberculosis. 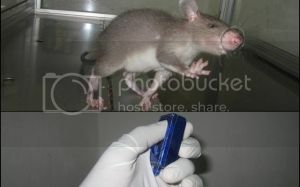 APOPO’s early experiences demonstrated that rats that grow up in the organization’s kennels are easier to train and are more effective scent detectors. Since many rats are needed for mine action and TB detection operations, APOPO’s research and development department is constantly working on ways to optimize the breeding program. Before placing rat couples in the breeding cages, the APOPO staff closely monitors the acceptance behavior of the animals in the introduction cage. Female rats either reject or accept a prospective mate in this cage and in cases of clear acceptance, the rat couples are placed together in the breeding cages. Crucial information such as the best timing for the female rats and the fertility period of the male rats go a long way in improving the productivity of the breeding colony. APOPO’s breeding program also ensures optimal care, feeding and medical attention to aid the overall welfare of the animals and subsequently improve the quality of rats available for training. Watson thanks you for giving it life! 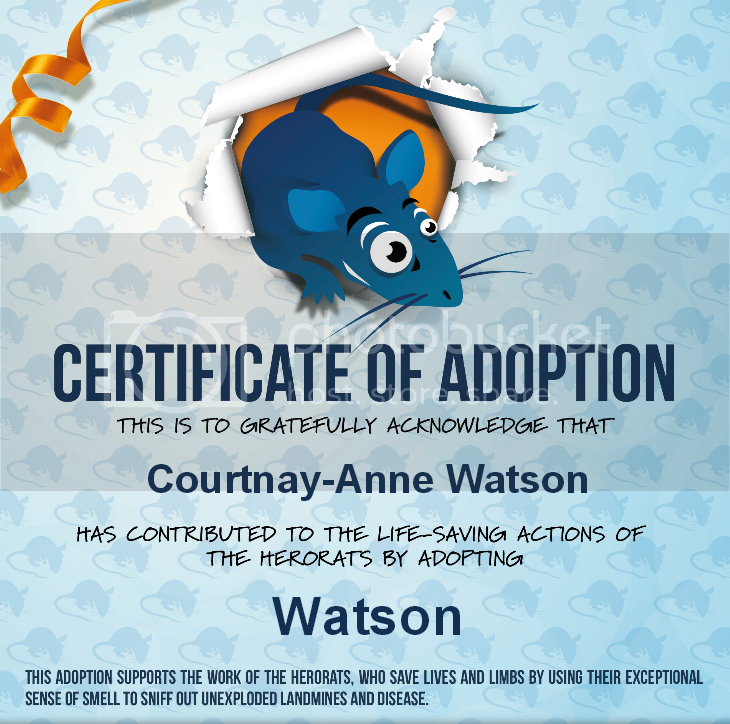 Congratulations Courtnay-Anne, you have adopted Watson, a baby rat on myapopo.org! Let us take this time to briefly introduce you to your HeroRAT and give you a quick glimpse at the extraordinary journey you will take with Watson. 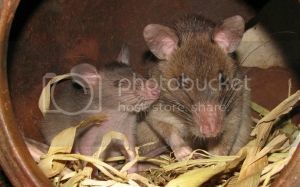 Watson is a baby African giant pouched rat still in its mother’s womb. It is expected to be born in about two weeks! The APOPO breeding facilities in Morogoro, Tanzania are very excited about the upcoming birth. Don’t be fooled, Watson is not your ordinary rat: it’s being trained to save lives! How can a rat save lives, you may ask? Well, some are trained to sniff out unexploded landmines that are left in the ground after a war ends and others are trained to sniff out tuberculosis (TB) in sputum samples from sick patients. Although this is not an easy task, the HeroRATs have been very successful in detecting both landmines and TB.